Since its introduction for the 1978 model year, the BMW 7 Series luxury sedan has remained true to its original character. It’s the BMW flagship, and this full-size, rear-wheel-drive sedan has always represented the pinnacle of technology and luxury in the German automaker’s lineup. As such, it’s an obvious choice for discerning buyers seeking a spacious and elegant sedan with a high level of curbside prestige. If you have been looking for luxury cars in the Mississauga area, then the BMW 7 Series at Pfaff BMW is the vehicle for you! Read on for more information. The 7 Series boasts a handsome, spacious interior with supple leather and rich wood accents adorning almost every surface. Highly adjustable front seats ensure comfort for virtually every body type. Large, flashy wheels and understated exterior trim contribute to a vehicle with powerful road presence. The 7 Series remains a standout in the handling department. The Dynamic Driving Control system contributes to this status, featuring four different settings that alter the driving characteristics of the car. We’d bet good money that most folks will leave it on Normal, but it certainly rewards owners who like to customize their cars to their own driving tastes. The current 7 Series is offered in five different models. The 740i and long-wheelbase 740Li feature a turbocharged 3.0-liter inline-6 good for 315 horsepower and 330 pound-feet of torque. The 750i and 750Li feature a 4.4-liter twin-turbo V8 that cranks out 445 hp and 480 lb-ft of torque. The top-of-the-line 760Li features a 6.0-liter V12 that produces 535 hp and 550 lb-ft of torque. An eight-speed automatic and rear-wheel drive are standard across the board, while all-wheel drive (xDrive) is optional for the 740 and 750 models. All are very quick, with even the 740i doing 0-60 mph in a claimed 5.6 seconds. The 7 also showcases a wealth of high-tech luxury features such as a night-vision camera and side view cameras. Some may still find the iDrive electronics interface system a bit complicated, but we think the current model’s improved layout is an elegant solution to a button-heavy dashboard. The use interface in the BMW 7 Series is a breeze to learn. It’s intuitive, convenient, provides safety, and will prove to be a worthy companion as you work in your BMW 7 Series. If you are looking for luxury cars in the Mississauga area, the BMW 7 Series is the vehicle for you. This top of the line luxury car can be found at our Pfaff BMW dealership. 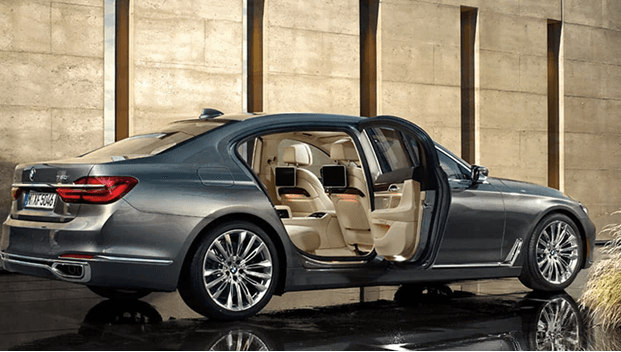 For more information about the BMW 7 Series luxury car, please feel free to continue browsing through otu website. Click here to find our contact information, schedule a test drive, or to fill out our contact form.